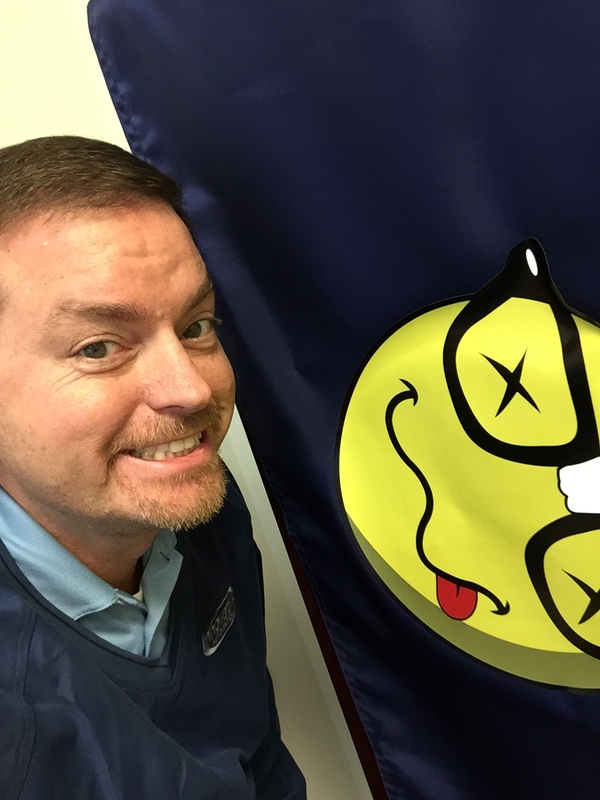 Sneak Peak-“Kickoff 2015” here we come Nerdvana Style!!!!! Hi I’m gene gray, welcome to the innovative intergalactic headquarters. Today me and buzz were talking about ways we can save you time, save money, and maybe even stress. If you’ve got a manufacturing facility with conveyors, with robots, machinery, all those machines the things that spin around, move back and forth, that motion, is created by and controlled by PLCs, touch screens, HMIs, AC drives, DC drives. 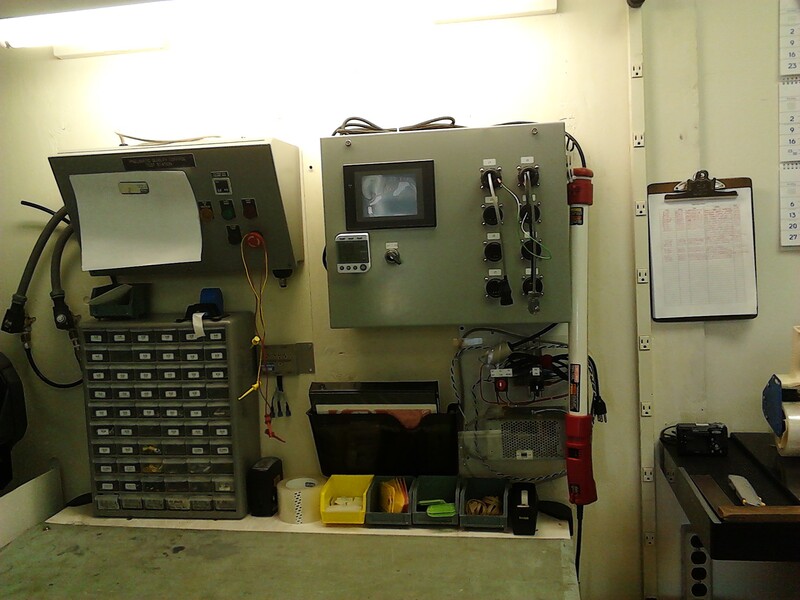 These are things that fail overtime do to age, vibration, your environment, and they can be expensive to replace. The three ways to contact us. You could send us an email, or you could call us at 1 800 237 3278 if you prefer, you could click on the link on this website to innovativeidm/repairs and whether you fill out the RMA form or we do it for you, if you call us on the phone what it results in is a piece of paper that you can print out, send in with your repair, and 1 of 3 things are going to happen. Of course we are going to provide you a free, no obligation quote, which is going to include a one year warranty. 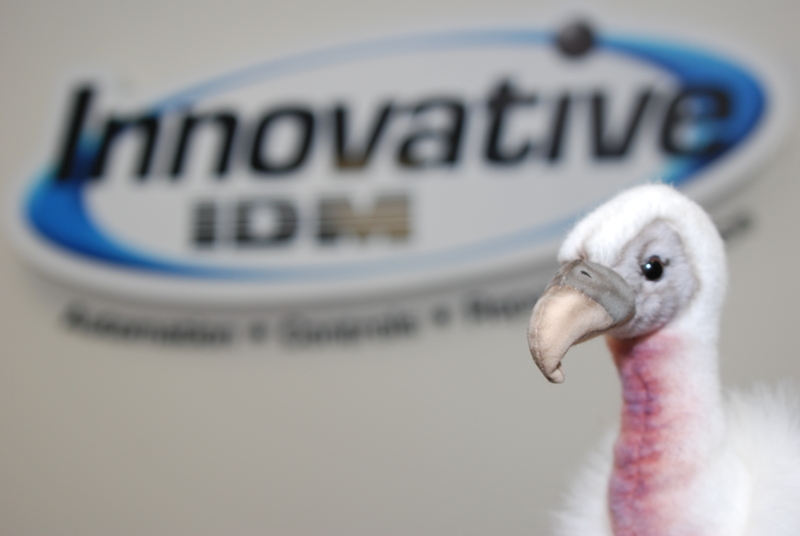 At innovative we don’t just repair your supplies we really refurbish them. Now call us up or get in touch with us and we’ll help you understand what that means. But once you get that quote you’ve got 3 choices. Go ahead and turn us loose to repair that item and send it back to you, have us recycle it because having it repaired doesn’t make financial sense, or simply let us return it to you unrepaired if that’s what you prefer to do. Now we’ve got 3 easy ways to contact us, we’ve got a simple no obligation quote for all those things you need repaired, now we make it easy. Why? Well simple right buzz? Cause its Innovative home of the legendary customer experience. 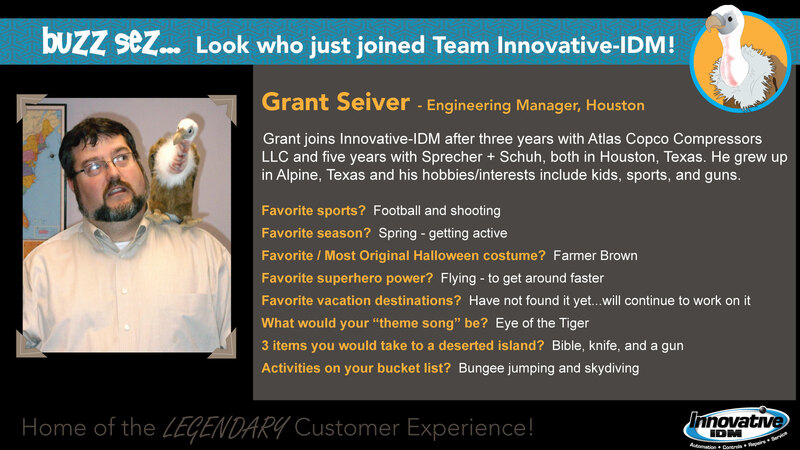 Join Buzz in welcoming Grant Seiver to Innovative-IDM! Grant joins Innovative-IDM after three years with Atlas Copco Compressors LLC and five years with Sprecher+Schuh, both in Houston, Texas. He grew up in Alpine, Texas and his hobbies/interests include kids, sports, and guns. 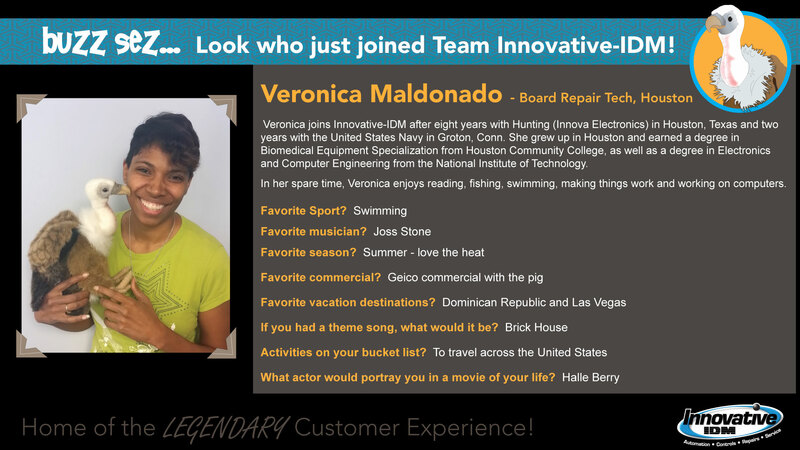 Join Buzz in welcoming Veronica Maldonado to Innovative-IDM! Veronica joins Innovative-IDM after eight years with Hunting (Innova Electronics) in Houston, Texas and two years with the United States Navy in Groton, Conn. She grew up in Houston and earned a degree in Biomedical Equipment Specialization from Houston Community College, as well as a degree in Electronics and Computer Engineering from the National Institute of Technology. In her spare time, Veronica enjoys reading, fishing, swimming, making things work and working on computers. When you walk through the Dallas Manufacturing department, there are many examples of improvements that have been made throughout the last year. 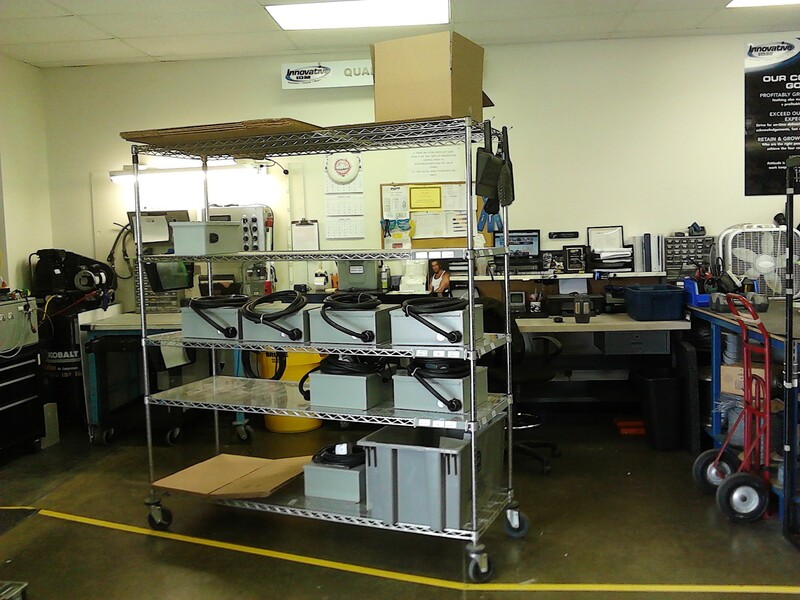 Here is what the Quality Control area looked like as of yesterday. 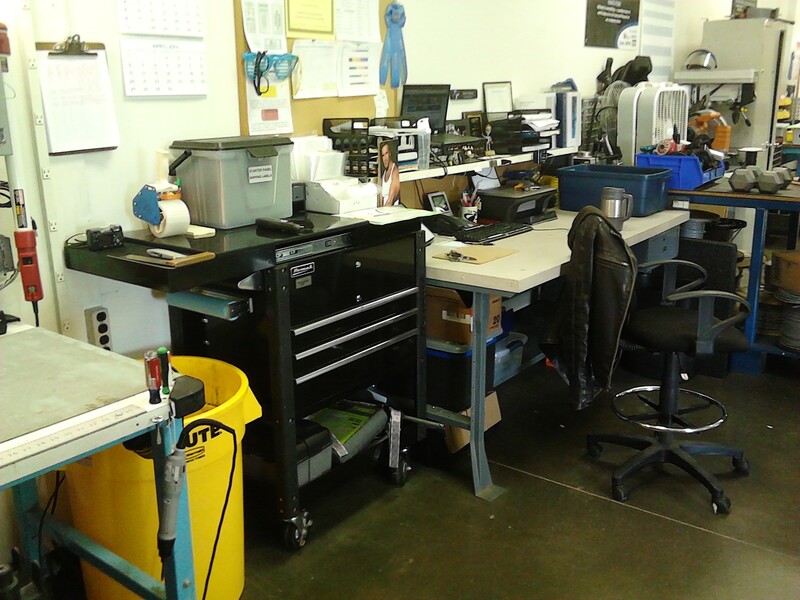 In the spirit of lean manufacturing, there have been some new changes to the QC area. Now, that makes for a great hoopla…Getting a little customer love to start your day! Buzz is always happy to hear such positive feedback! Who knew Buzz had been to space? 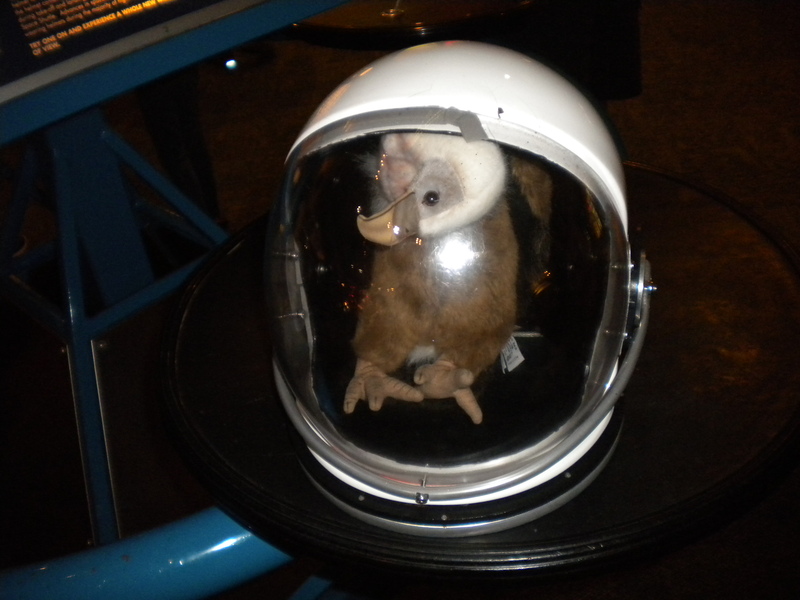 Here he is preparing to launch into the great beyond. Buzz said he was excited about space flight, but that the suits were a little tight. Buzz has the Right Stuff.